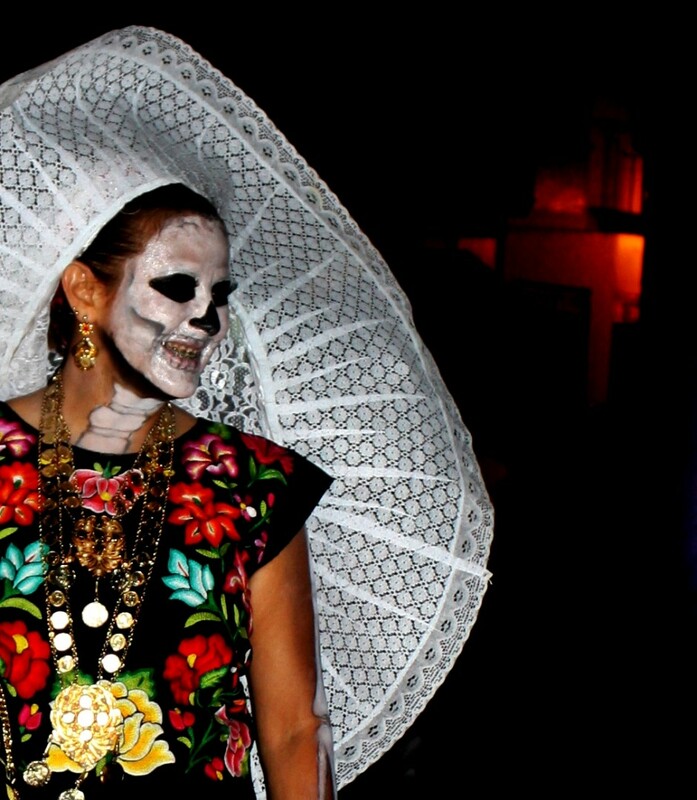 Photographer Tara Lowry shares images of darkness and light from Oaxaca’s Day of the Dead. DAY OF THE DEAD and Halloween may look alike, but while Halloween has an obvious spookiness factor, it’s not REALLY about death. It doesn’t make you stare your mortality in the face and challenge you to dance on the graves of people you loved. Dia de Muertos reminds us, in all of its colour and darkness, joy and grief, nostalgia and celebration, that we must live, that death will come one day, whether we want to admit it or not. Its message: Don’t wait until later — live your life now. 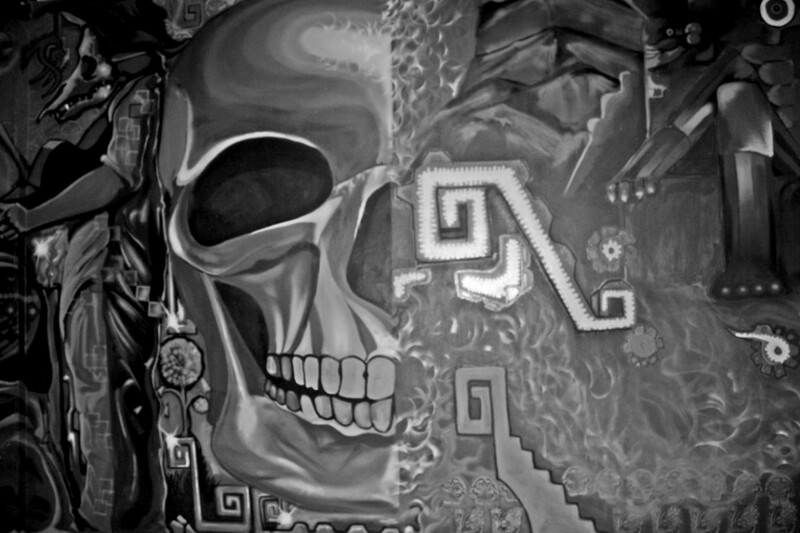 Day of the Dead in Oaxaca, Mexico, is a bipolar affair. Without the vibrancy and colour, it wouldn’t be the celebration of life that it is. Without the darkness and melancholy, it wouldn’t hold the emotional depth that it does. The many contrasts and contradictions are what make the holiday. 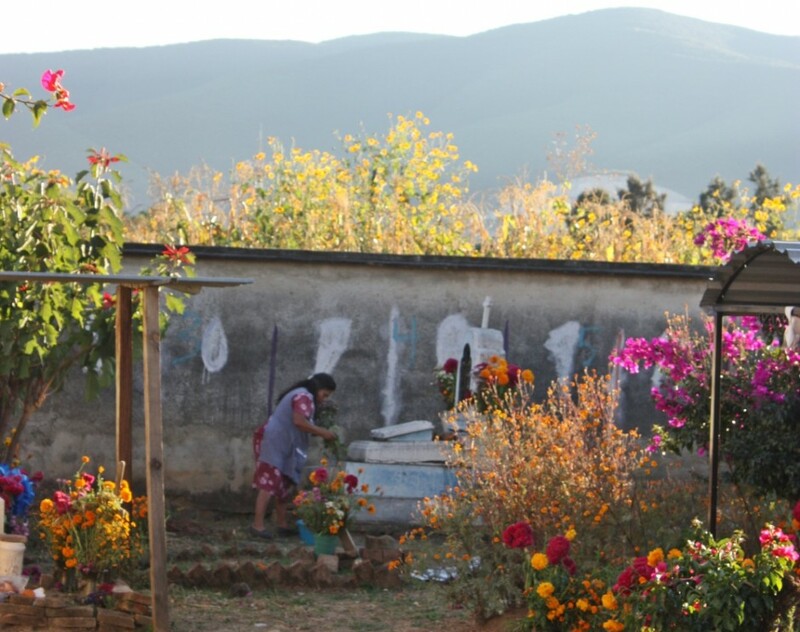 San Miguel is the main cemetery in Oaxaca and where the majority of events for Day of the Dead take place. 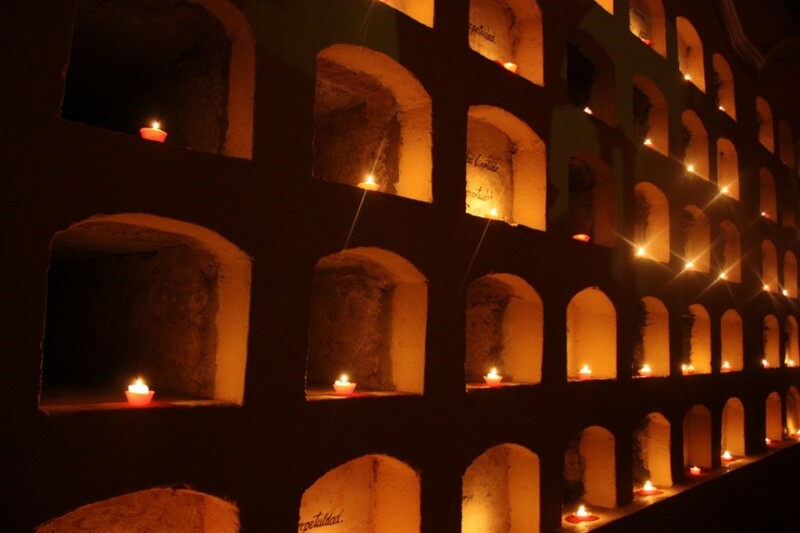 Tiny candles are lit in its tombs, casting a soft light into the large space. Thousands of visitors will pass through over the first two days of November. The whole family takes part in the preparations and vigils on the eves of November 1st and 2nd. 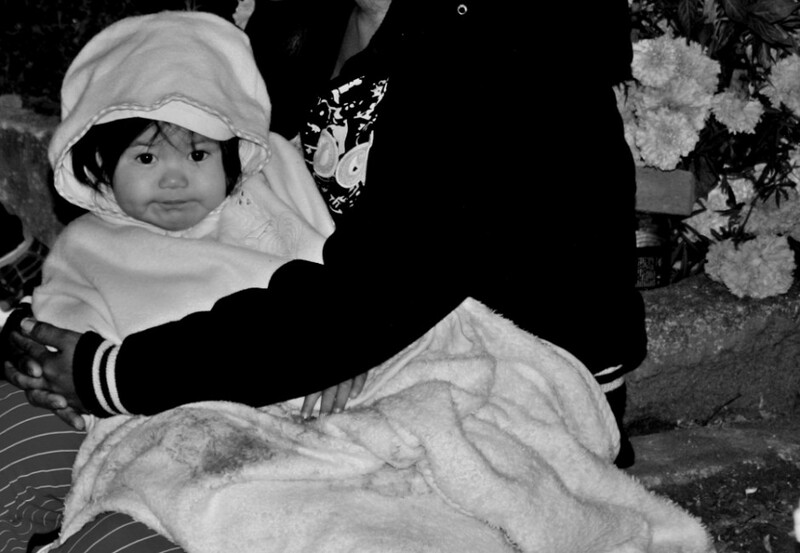 Even the littlest of Oaxaqueños spend the night in the panteones (cemeteries) awaiting their visitors from the Other World. 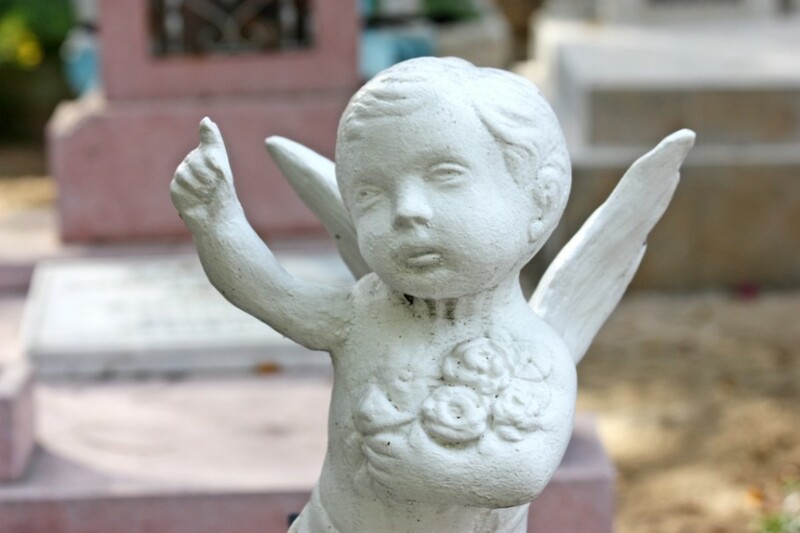 Starting on October 31st at around 3pm, the various cemeteries of Oaxaca prepare for the arrival of the souls of babies and children. Known also as the Catholic "All Saint’s Day," this 24-hour vigil reminds us of the frailty of life. I'm awed at the bravery of this holiday. Despite the sadness provoked by remembering the death of a child, these lost little souls WILL be remembered. Dia de los Muertos faces intense emotions head on. The music, food, gathering of friends and family, and the festivities are the balms that add sweetness to the bitter. The cempasúchil is the flower used on Day of the Dead to decorate altars and grave sites in Mexico. In the days leading up, markets overflow with these bright orange flowers, and they can be seen all around town in the arms of locals heading to the cemeteries. 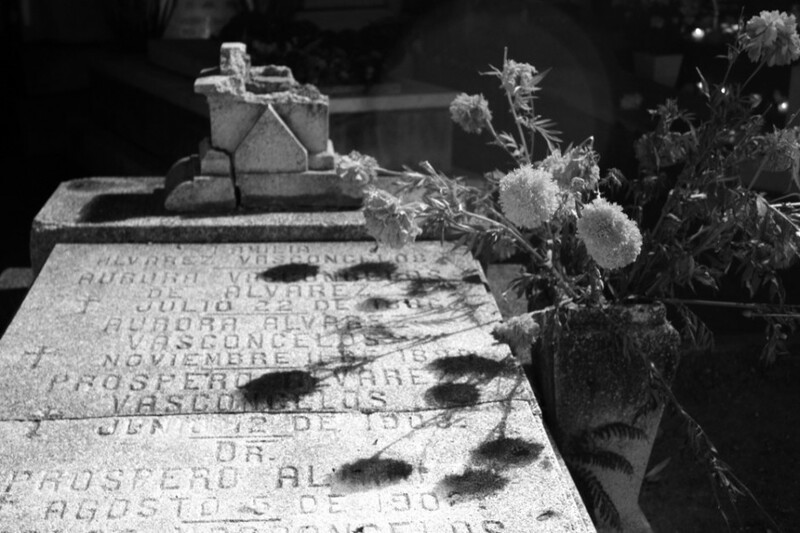 Here in the main cemetery, a bouquet of Flores de Muertos ("flowers of death") casts shadows over a grave marker. Never is the contrast of dark and light so evident as during the wee hours of the morning in the cemeteries of Oaxaca. 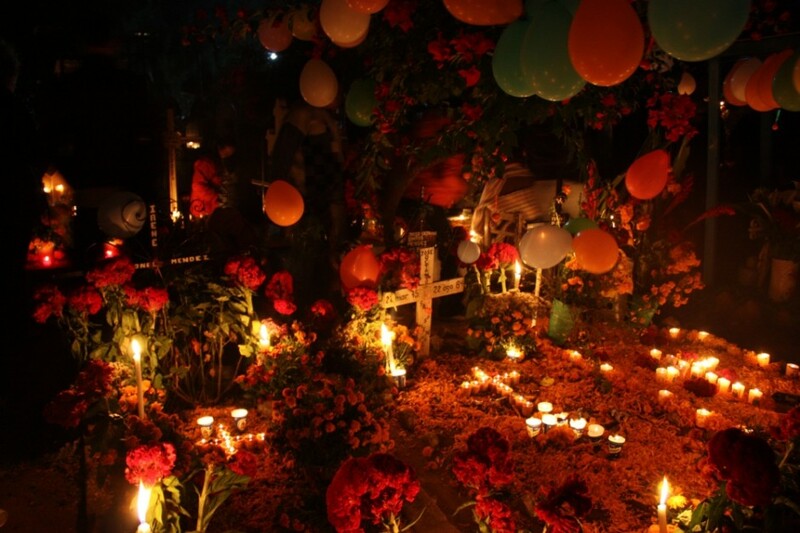 Here the darkness of Xoxocotlan Cemetery is lit up by candles, bright flowers, balloons, and other decorations used to adorn this group of family grave sites. 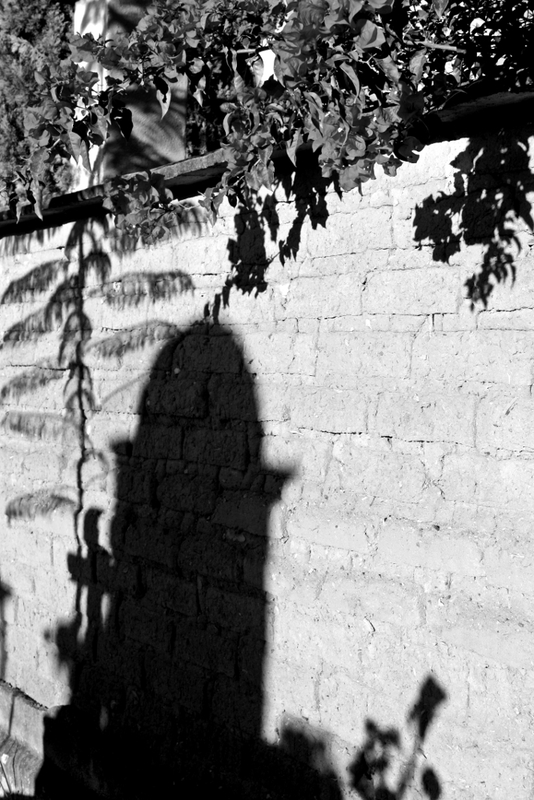 In the daylight, a tomb casts its shadow onto the outer wall of a small cemetery in Santo Domingo, just outside of Oaxaca. In the Cemetery of Santo Domingo, a local woman tends a small tomb, watering the plants and replacing the dead flowers with fresh ones. Here the graves and altars tend to be simpler, not as elaborate as the ones in the center. On November 2nd, family after family pour through the gates with pan de muerto ("bread of the dead"), mescal (alcohol similar to tequila, made from the maguey plant), and tamales. An altar set up in honor of Maria Sabina. Sabina spent her life in the Sierra Mazateca in the state of Oaxaca and was a celebrated traditional curandera who incorporated psilocybin mushrooms into her healings. Her techniques attracted the attention of the likes of John Lennon, Mick Jagger, and Bob Dylan. 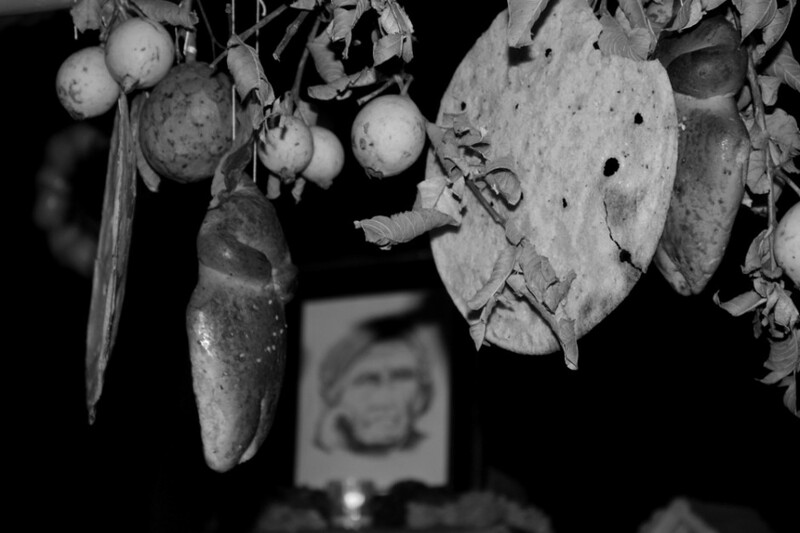 Towards the end of her life, Sabina became disillusioned by the misuse of the sacred mushroom by foreigners who utilized it as a way to get high without the spiritual connection. 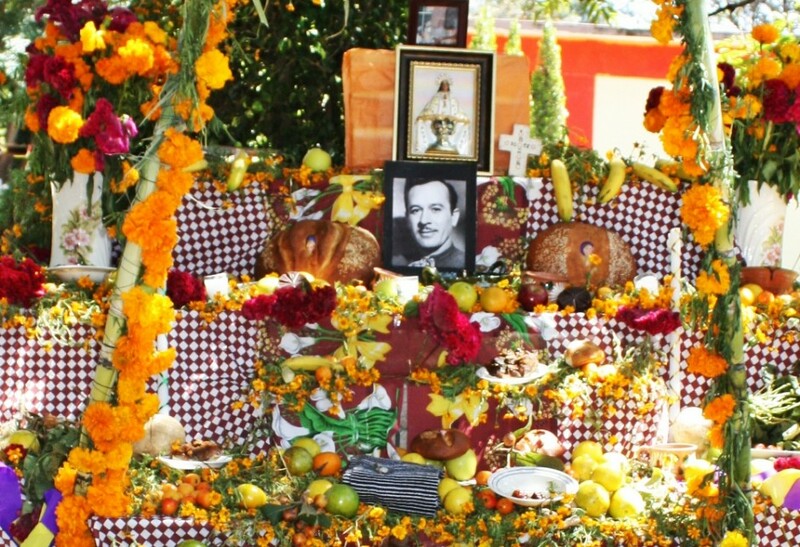 An altar dedicated to Pedro Infante, an iconic actor and singer from the Golden Age of Mexican Cinema. His comic style, melodic voice, and fun-loving characters made Infante one of Mexico’s most beloved and famous personalities of all time. According to the author of Loving Pedro Infante, “If you're a [Mexican], and don't know who he is, you should be tied to a hot stove with a yucca rope and beaten with sharp dry corn husks…. If your racial and cultural background or ethnicity is other, then it's about time you learned about the most famous of Mexican singers and actors." Infante died in 1957 in a plane crash where he was the pilot. 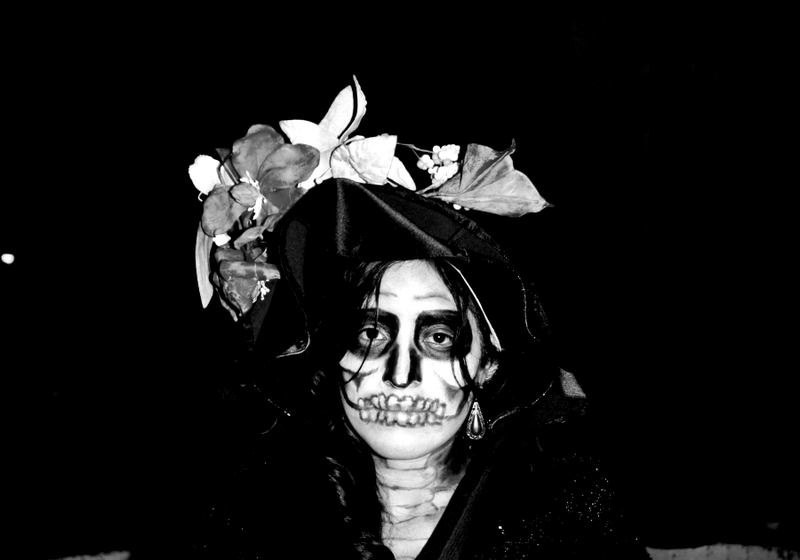 Many women dress up as La Catrina (aka, the "Elegant Skull"), the most iconic symbol of Day of the Dead. Her image is imitated and duplicated in a multitude of mediums. Here, a young woman takes a break from the merrymaking to allow a wave of grief to pass over her. An Istmeña woman incorporates her colourful traditional dress to create a beautiful Catrina costume. El Istmo de Tehuantepec, a matriarchal isthmus located 253km southeast of the city of Oaxaca, is known for its strong women, elaborate dress, and for being the center of Zapotec culture. 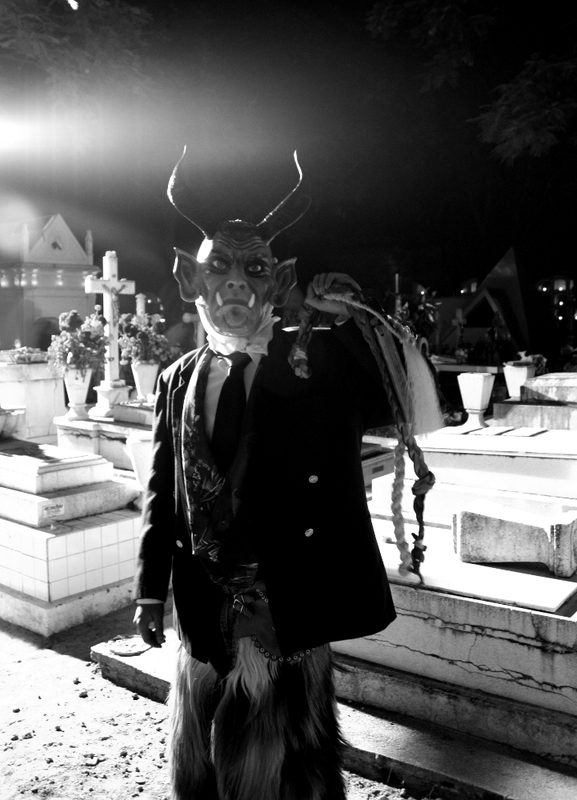 A horned demon breaks away momentarily from the pack of diablos he's part of to visit the grave of a loved one. Comparsas fill the streets in the weeks leading up to Day of the Dead. 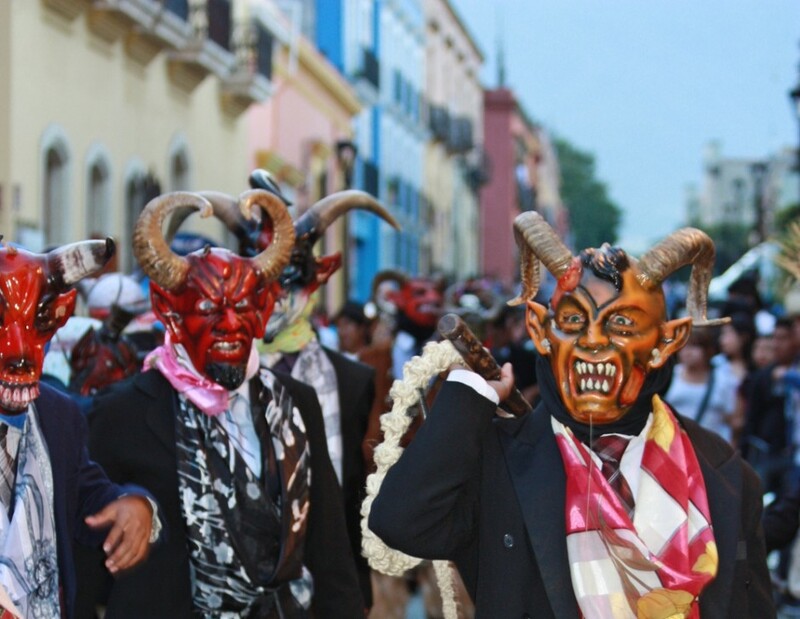 These Dancing Devils are from Mixteca and roam the andador (main pedestrian street) and zocalo (main plaza in the centre of Oaxaca), cracking their whips and mock-bullying the crowds. They are accompanied by loud brass bands and lots of attitude. Music is an essential part of Day of the Dead. 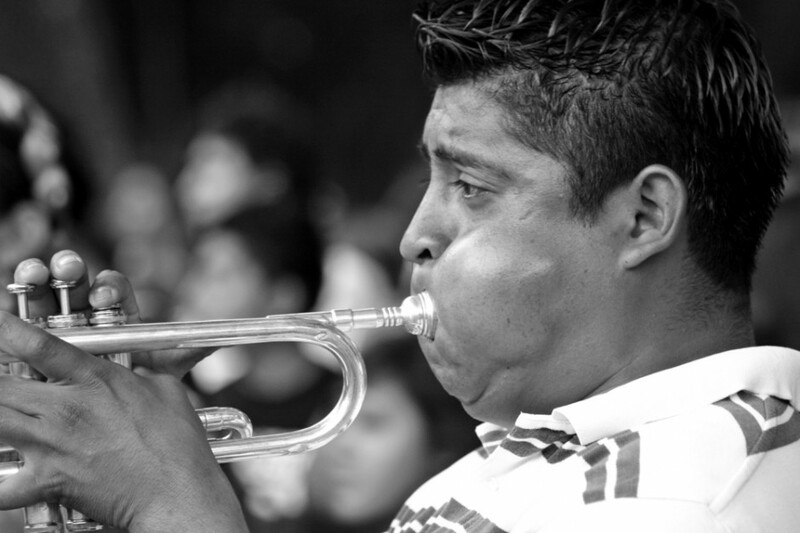 Trumpet, tuba, and guitar players coax both upbeat and melancholic sounds out of their instruments. Mariachis belt out favourite tunes of the defunct, hoping to entice them to join the party. 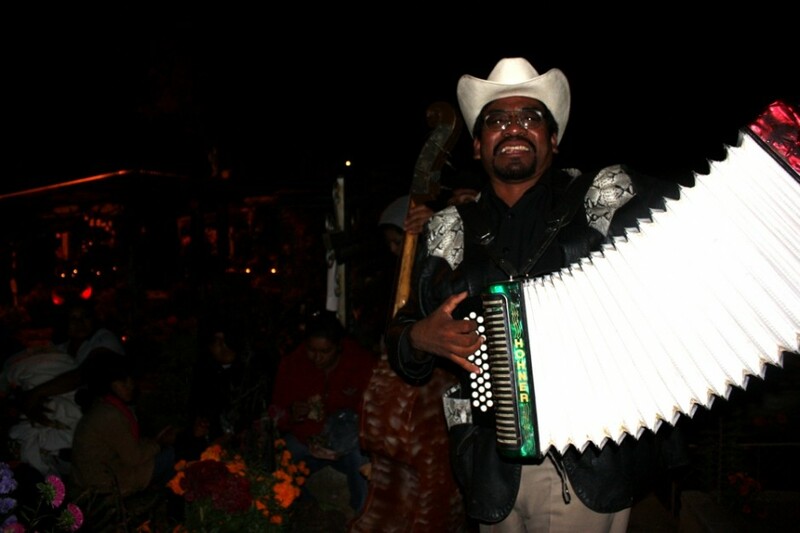 This accordion player in Xoxocotlan Cemetery plays a lively song while families sit around gravestones telling stories about their loved ones and keeping warm with Oaxacan hot chocolate and tamales. Large murals are found on many of the walls of the small side streets in the neighbourhood of Xoxocotlan.